For the third year in a row I pulled Dracula off the shelf for R.I.P. - and this time I've actually read it! I think it's taken so long because I'm not keen on vampire stories and I imagined pages and pages of crypts and coffins, swooping bats and fangs dripping with blood. So it was a very pleasant surprise to find it wasn't like that all and I ended up enjoying it immensely. The story is told in epistolary form in a series of journal and diary entries, letters , a ship's log and newspaper articles. It begins with the journal of Jonathan Harker, a young lawyer who is travelling to Transylvania to aid Count Dracula in his purchase of an English property. His initial enthusiasm for travelling in a foreign country gives way to a growing sense of unease as the superstitious local peasants he meets try to warn him off. After a frightening final stage of his journey he is welcomed to Count Dracula's castle only to find after several sinister experiences he is a prisoner. Letters being exchanged between Mina and Lucy. Mina is worrying about not having heard from her fiance, Jonathan, while Lucy chatters on about the three proposals of marriage she's received. It seems inconsequential at the time but is really a very clever way of introducing all the young men who will become the 'vampire hunters'. There is also the journal of Dr Seward and his lunatic patient, Renfield. Mina and Lucy go to Whitby - this is my favourite part of the book because it's seldom I can use memory rather than imagination for a setting but I have been to Whitby. I felt as though I was walking alongside Mina and Lucy as they climbed the many steps to the abbey, sat in the churchyard and stood on the cliffs looking over the Old Town and the harbour. Loved the vivid description of the storm and the ship that runs aground. Professor Van Helsing, an eminent medical man, is called in from Holland to help treat Lucy's illness. He completes the group that will band together to track down and destroy Count Dracula. Dracula is an exciting adventure story, a battle between good and evil - it's compelling reading and, I confess, I even shed a tear at the end . For the modern reader it's also a glimpse of Victorian attitudes particularly the role of women. 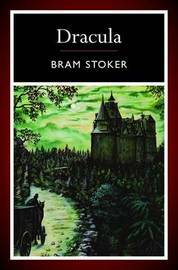 Well done, Bram Stoker, for creating a heroine as strong and resourceful as Wilhemina Harker! Great reading - loved it! I took a long time to read like you but found some parts confusing and or long winded so didn't enjoy like you. Glad I have read the classic though. Some parts were a bit slower but that didn't worry me at all. I'm pleased to read it at last. I read this a few years ago and also really enjoyed it. It's not the book you would expect from watching vampire films. It is so much more interesting and complex and Mina is a wonderful character. I think it might be time for a re-read! It wasn't at all what I expected and I thought Mina was a terrific character for a Victorian male to create. As a child, I read a graphic-novel kid's edition of this, which absolutely terrified me, so it was years before I could read the actual book. Like Anbolyn, I'm thinking maybe I need to read it again - just in time for Halloween. I didn't think it was terrifying at all - a few moments of horror but overall just a a great story. I think I need to read this one. I admit I steered clear of it not so much because of the vampire thing but because of the horror thing. I get so scared of horror stories! But I read Frankenstein and found it interesting (though Frankenstein himself was a jerk), and so I think I need to do Dracula, too. It's on my Kindle! It's not as horrific as one might expect - I think we expect it to be because of the movies and other Dracula based tales. Enjoy!! Great review, Cat! I'm glad you enjoyed it, too. And wow, that's awesome that you have visited Whitby -- that had to be a wonderful feeling encountering it in the story! It did add that extra something - it's a unique little town and a perfect setting for this part of Dracula. I read Dracula for RIP a few years ago and enjoyed it. Mina is a great character, isn't she? And I love Whitby too - I live less than two hours away and it's one of my favourite places to visit. I agree that it often makes a book more enjoyable when you're familiar with the setting! My father was born in Bridlington so part of my ancestry lies deep in Yorkshire and it was wonderful to be able to visit and explore this beautiful part of the UK. I do love this book and I always enjoy reading a review from somebody who was hesitating to read but then really liked it too. I don't know why that is - I'm not the author after all!! I suppose when we love a book we want everyone else to feel the same. I'm so glad you liked this. It's years since I read Dracula, but I remember being very taken with it, and that it was't at all what I had expected. I have the Penguin English Library edition in my library pile and I hope to re-read before the end of the R.I.P. season. Hope you'll enjoy your reread, Jane. I'm glad you liked it. I think many people expect Dracula to be similar to the vampire books that are being mass-produced today, so a lot of people are rather surprised when they like it. :) I think he did a fantastic job of keeping up the spooky atmosphere. I think I was one of those 'many people' and I was both surprised and delighted to find how much I liked it.